The choir I'm in, Sonus Divinus Choir, is planning to hold a concert in October this year. I was in charge of the brochures, flyers and posters, also ticket books, basically everything printed. The board also suggested if we could make some sold merchandise or cheap souvenirs to give away to the ticket buyers. I have 4 design alternatives done now for the flyers/tickets, so I decided to start making samples for the souvenirs. Remember the recycled notepads I made? 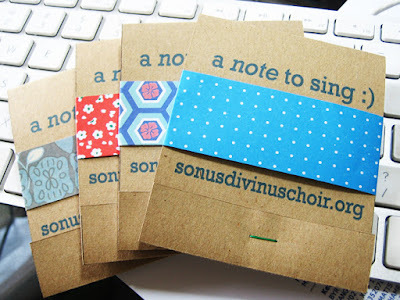 I'm making a quite similar one except that I added prints on the cover saying a "note" to sing. I think it's pretty catchy. The random patterned paper strips also make it prettier at the front. I love the idea so much, but my mom, who is also on the board, doesn't think so. She said notepads don't last long. Oh well, if anyone is getting married or hosting a party and would love to have these as party favors, contact me!